$120.00 OFF! Get $120.00 off with instant coupon at Intuit.com! Just released – The new 2015 versions of QuickBooks Accountant are here! And now through April 30, 2016, you can already get $120.00 off on the single-user pack of Accountant 2015 when purchased at the QuickBooks Store at Intuit.com. Be sure to also consider the Plus version, which gives you added features like client collaboration and copy-to-file transfer service, for a lower monthly fee. This coupon is activated when you follow the above discount link (exclusively offered to us by Intuit) so no other codes are needed. $200.00 OFF! Get up to $200.00 off on QuickBooks Accountant at Amazon. As Amazon clears stock to make room for the 2015 version coming soon (which are already available), you’ll find the remaining QuickBooks Accountant 2014 editions are now deeply discounted at Amazon (with free shipping!) for up to 42% off the retail price. Just keep in mind that prices may vary daily across versions and whether it’s in stock, so see Amazon for the full listing of QuickBooks software on sale. Follow the above link to learn more – No coupon code is required for this deal. Subscription Get Accountant as a subscription for $28.99/month. If you upgrade to the newest Accountant’s version every year, then you may be better off signing up to the subscription version. Not only do you avoid the upfront charge to upgrade, but the monthly subscription will be about $100.00 cheaper than buying the boxed version every year. Your QuickBooks Accountant subscription also includes free upgrades through the year when new features are released (no waiting for the release of the box). You will be able to add additional users to your membership as well when needed. 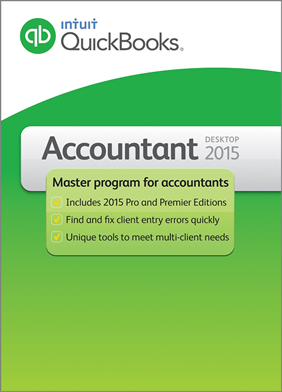 Where can I you find a trial version of QuickBooks Accountant 2015? Unlike most other software companies that offer free trial versions of their products, Intuit does not. All QuickBooks and Quicken products are not available to try for free, however they do offer a 60 day money back guarantee on them. So if you’re not sure if Accountant 2015 is right for you or if it’s worth waiting until the 2016 version is released, then you can buy a copy now risk-free. If you decide to return it, just fill out the steps posted here.